Home » Perspectives » Which NTA program is right for you? Do you find yourself being the go-to for health and nutrition advice in your friendship or family circles? Does your passion for nutrition often result in hours spent geeking out over the latest nutrition articles and scientific discoveries? Whether you’re a fitness instructor, stay-at-home parent, healthcare professional, or merely want to further your nutrition knowledge, our courses are designed for you. As a student of the NTA, you’ll gain practical, effective tools to educate and help to heal the world through holistic and sustainable practices in food and wellness. Yes! That’s me, but which program should I take? To answer this, you will need to ask how you see yourself using your certification. Let’s take a quick look at our programs. A certified holistic nutrition practitioner uses powerful functional clinical assessment tools to connect directly to their client’s innate intelligence to identify areas in need of nutritional support. They make food, diet, and lifestyle and supplement recommendations to balance body chemistry and achieve optimal wellness from a foundational, holistic perspective. NTPs can really hone in on imbalances and deficiencies in the body for clients who need deeper healing. If you’re looking to embark on a new career as a Nutritional Therapy Practitioner and work 1-on-1 with clients in a professional practice, you enjoy diving deep into anatomy and physiology, are interested in using hands-on applications, or you’re a current practitioner looking to integrate robust and effective nutrition services into your pre-existing practice, the NTP program is for you. What is a Nutritional Therapy Consultant? A certified holistic nutrition consultant uses their deep foundational, nutrition knowledge along with skills they learn in culinary and lifestyle assessment to make food, lifestyle and supplement recommendations to help clients balance body chemistry and achieve optional wellness. They coach, motivate and provide practical, daily life action steps for clients who need extra support integrating dietary and lifestyle recommendations. If you’re looking to gain the knowledge and confidence in holistic nutrition and use culinary and lifestyle assessment skills to provide more practical, daily life action steps and dietary recommendations for you or your clients or you’re a health and wellness professional looking to enhance your current career with holistic nutrition and culinary knowledge, the NTC program is for you. Have additional questions? Speak to one of our Admissions Advisors. They’re here to help you define the course that fits your vision! 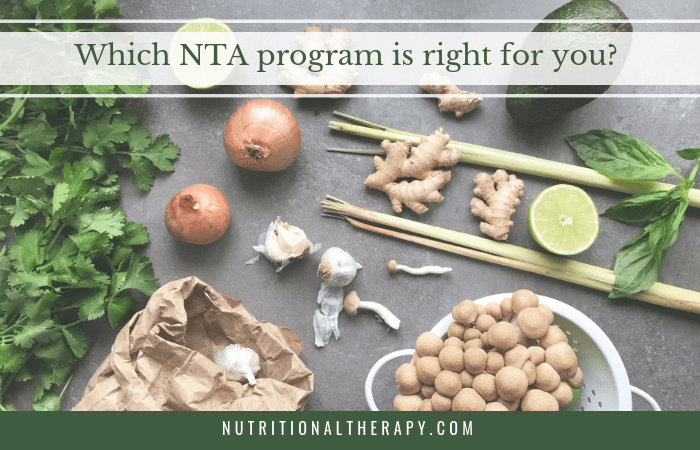 You can reach them through the chat feature on the bottom right side of this page, by email NTA@nutritionaltherapy.com, or simply by calling (800)-918-9798.